Like any normal farmer, you grow plants to eventually harvest a large crop and cook a lot of delicious food. But what if the dirty animals make their way to your farm and spoil your crops? At the moment, Minecraft PE can not provide you anything useful to protect the farm. 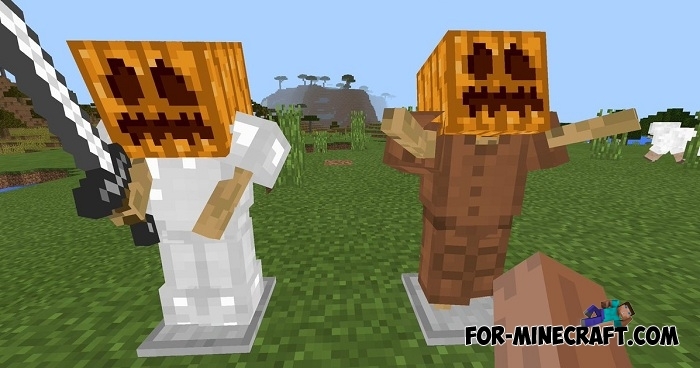 In that case, try the Scarecrow addon which adds two statues similar to a human form. There are two types of scarecrows: the first one can drive away only rabbits who adore carrots, and the second type works as a guard, frightening aggressive mobs. Their recipe is simple and shown in the screenshots. You need an armor stand, armor (leather or iron) and a sword (only for the second type). The finished scarecrow is immobilized but repels the pests with its appearance. Put it somewhere in the middle of the field and go for your business. Oh yeah, pay attention to the Pam's Harvest Craft PE mod, you've never before seen so much new food, seeds and plants. How to install the Scarecrow addon? Go to the game setting and activate it. Crop Harvester addon for Harvest Craft PE (MCPE)This addon for the Harvest Craft PE mod will greatly simplify the cultivation of fields. The addon adds a crop harvester block and 3 improvements to it..
Pam's Harvest Craft PE Mod for Minecraft PE (v2.4.3)Pam's Harvest Craft PE is a ported version of the original mod for Minecraft Java Ed. This mod adds many new types of food and various agricultural plant species.. Harvest Craft mod (Minecraft PE 1.0)The Harvest Craft mod adds a lot of berries, fruits and vegetables and a bunch of food. Use cookware for cooking juices, mixes, soups, salads and other delicious dishes.. Animals addon v6 for Minecraft PE 1.1.0/1.2.10Animals addon is 27 new wild animals that can be tamed by you. These are mainly cats..
IndustrialCraft PE mod v2.0 Pre-Release 7 for Minecraft PEIndustrialCraft PE is a global mod for MCPE which is a very accurate IndustrialCraft copy for Minecraft PC. It contains the basic mechanisms, generators, and energy..